What’s become an iconic collection at the Oklahoma City Museum of Art is going away, at least for a while. KGOU’s Kurt Gwartney recently took a tour of the Dale Chihuly exhibit before it closes for a nine-month process of cleaning and re-installation. Alison Amick, curator of collections, and Leslie Spears, communications manager, were the tour guides. Oklahoma City Museum of Art’s president, Glen Gentele, tagged along during the tour. He said the museum will have an announcement April 1 of a new exhibit coming to Oklahoma City. 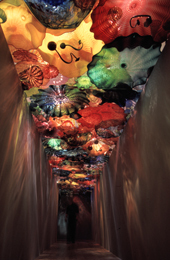 The last chance to see this particular installation of the Chihuly is April 3. It will be off display for about nine months, re-opening sometime in January of 2012.